The Chardonnay is, par excellence, the white grapes of Burgundy although, much more versatile than Pinot Noir, as the great Jancis Robinson reminds us in his World Atlas of Wines, it can be grown with good results practically everywhere, except extreme limits of the viticulture zone (its early blooming makes the risk of damages due to spring frosts high). It has become the most famous white vine in the world, perhaps because it does not have a particularly incisive taste and therefore lends itself to fermentation or aging in oak barrels. 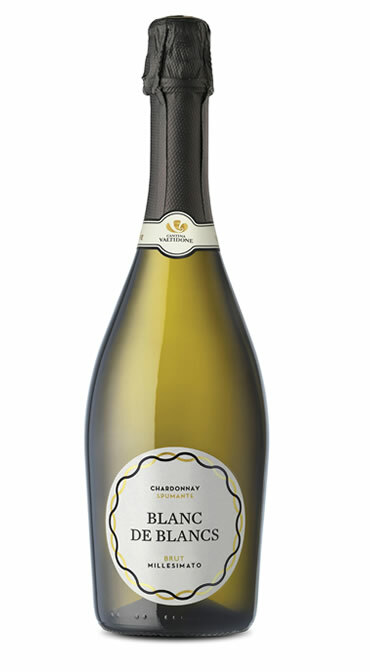 It tends to assume the desired character of the producer: lively and sparkling, fresh, rich and buttery, even sweet. It can produce a dry and sharp wine like Chablis, but it is also fundamental in the production of sparkling wines par excellence, those of Champagne. The result is a fresh, delicate, fruity wine with a high alcohol content, both still and sparkling, which is particularly suitable for aging in barriques and aging. In addition, it is used in grapes for the production of the best sparkling wines in the world, including obviously the Italians Trentodoc and Franciacorta. As mentioned, Chardonnay is one of the most known and cultivated white grape varieties in the world, some scholars think it has Middle Eastern origins, but recent studies have highlighted a molecular structure that suggests both the fruit of a spontaneous cross between Pinot Nero and Gouais Blanc, probably in the Carolingian period (VIII-X century) in Burgundy: originally planted by the Cistercian monks of the abbey of Pontigny, from there it spread gradually throughout the world since the late nineteenth century. According to another theory the origin of this wine should be sought in the hills of Jerusalem; in fact this vine grows very well in clay soils (like those in Jerusalem) and the word Chardonnay has Jewish origins. The first Crusaders, on their return from the Middle East, also reported wine whose original name was Porte de Dieu because it was the translation of the Hebrew name Shahar Adonay, which means “the door of God”. The vineyards were all around Jerusalem, a holy city, whose doors all led to the Temple of God. It is a vine that can give good results even with relatively high yields, and excellent results with low yields, and stands out for its ability to adapt to very different terrain and climates. These characteristics, combined with the particular fortune that he met in the New Wine World (in particular Australia, United States and Chile), where the most trendy varieties become real “trademarks”, have contributed to the exponential growth of his fame and international dissemination. In Italy, it has long been confused with pinot bianco, and only since 1978 is registered with the National Register of Vine Varieties. The first to obtain the DOC was the Alto Adige Chardonnay in 1984, and since then, having overcome the initial reticence to include “Gallic” vines in the Doc and Docg specifications, the Chardonnay gradually spread over most of the national territory. Nowadays it is cultivated in all the regions, including the Colli Piacentini, with Cantina Valtidone that has made it, over the years, the fulcrum of the production of its sparkling wines, such as the Blanc de Blancs Millesimato, but also in Sicily, in Trentino-Alto Adige, in Piedmont, in particular in the Langhe, in Lombardy (in Franciacorta, in the grape blend, to produce sparkling wines), in Veneto, in Friuli-Venezia Giulia and in Abruzzo. It has medium, round leaf; the cluster is medium-sized, pyramidal, tight, slightly winged; the grape is of medium size, with a medium-firm skin, tender and golden-yellow in color. The vigor is high, the regular and abundant productivity. The harvest is quite early (first decade of September or in some hilly areas even in August, for the production of classic method wines such as Franciacorta). It prefers temperate-warm climates, hilly, clayey and calcareous soils, ventilated and cool environments. It is sensitive to spring frosts. By its very nature, which allows an infinity of declinations, it is practically impossible to indicate a range of dishes or foods with which Chardonnay is exalted. In its most basic, simple and fresh versions, the best place is probably at aperitif time, but if we are faced with a Chardonnay aged in small barrels, certain typically buttery notes are enhanced with cheeses, better if aged. And if instead in the glass we had a blanc de blanc, or rather a sparkling wine exclusively from Chardonnay grapes, it is with shellfish that would give its best.